So what is the RC field box (also called the RC flight box), and why do you need one? The field box is essentially a tool box that you take to the flying field with you. No room left in the back of the vehicle for the RC field box. Looks like it gets to ride shotgun - again! 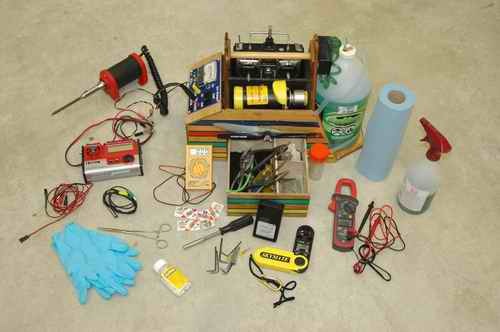 This "tool box" usually holds your radio, some tools, LiPo batteries & maybe charging equipment for electric helis. For fuel powered helicopter & planes, it will also contain starting equipment and fuel. Stocking your flight box with a number of small, yet common wear & tear parts for quick "field repairs" is also a good idea. Basically you are bringing a little bit of your workshop out to the flying field if you need to make adjustments, small repairs, and have a convenient way to carry and get all that stuff out there in some resemblance of an organized fashion. I need all the help I can get in that department when the back of the vehicle is jammed full of flying egg-beaters. Below I'm showing two examples using my personal RC Field Boxes. 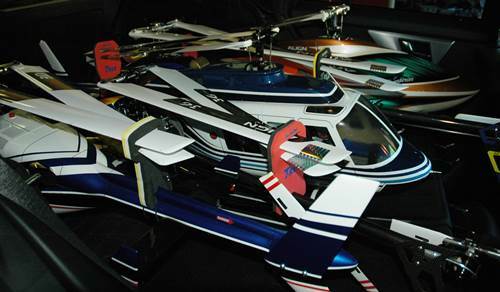 The first one is specifically for nitro helicopters, the second one for electric helicopters. I'll explain why they differ and how they are stocked differently. The above picture shows an example of a basic well equipped nitro RC flight box with tools, spare parts, fuel, and starting equipment. You can make your own RC flight box, purchase a kit, or purchase a ready built box – it is up to you and your budget. A field box specifically for nitro differs from electric in two main areas; but you can certainly use the same field box for both. I just find it easier having two separate ones. The two main differences is the nitro box usually has an extension on one end to hold a one gallon jug of nitro fuel along with an electric fuel pump. The other end has a compartment for a 12VDC gel lead acid battery & power/glow panel which is needed to power the starter, glow plug socket or driver/charger, fuel pump, and maybe a small computerized battery charger if you take one out to the flying field. 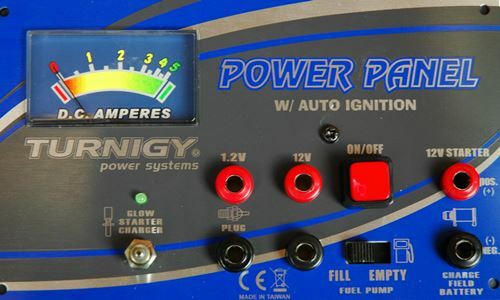 Here's a close up photo of a typical power panel. Okay, it's not a box, it's a bag, a nylon tool bag to be exact. I have found this small sized tool bag perfect for my electric RC needs. It has lots of nice little compartments inside and out for tool and accessory storage, it's light, inexpensive, and perfect for holding/carrying a bunch of heavy LiPo's and removable battery trays. You could certainly use one of these tool bags for nitro as well if you have on-board glow drivers in all your aircraft, electric starter with built in battery, and don't mind them getting oily from the nitro fuel. This flight bag I've been using for the past few years was just a freebee that came with a cordless drill set. As you see, I'm also showing my old trusty ThinkPad laptop which is perfect for rough RC field use. Bringing a laptop out to the field is something I don't always or even like to do; but with all the flybarless systems and ESC's that are programmable or have data logging features; I find more times than not, I'm reaching for the laptop at least once or twice during a day of flying (especially on newer builds that I'm still adjusting/tweaking or collecting post flight data on). I also use the laptop for FPV flight recording/playback when I want to record a FPV flight; so like it or not, the laptop has become an extension of the field box in this day and age. That said, more and more FBL systems and other electronic goodies also offer Bluetooth connectivity with your smartphone; so the laptop at the field may soon be a redundant fixture only - can't wait! 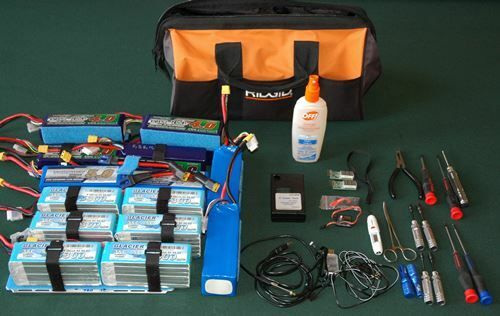 Shown above is what I normally have crammed into my my electric RC field bag. It can hold a good afternoon's worth of LiPo packs, basic tools, electrical test equipment, USB cables/dongles to plug into the various components on-board the aircraft, and of course bug spray or sun screen. I suppose that is a good lead into what items you generally take out to field. Below I have a fairly complete list of everything I usually take with me out to the flying field in my flight box/bag along with some other items that are usually thrown into the back of the vehicle. I have basically divided it into two categories: should take & maybe take. The should takes are the items I personally could not leave behind when I go flying, the maybe's are things I sometimes take, but don't consider them must haves. I've also noted any items that are specific to fuel/nitro or electric. This is by no means an exhaustive & perfect list for everybody and you'll find out soon enough after getting into the hobby what stuff you left at home that you should have brought or stuff that you bring and never end up using. Hopefully however this list will give you a good starting point. I did try to include links when I could from one popular online source so you can have a peek at the individual items in more detail if you wish to learn more about them; or even order up much of your field box contents if you so choose. Portable soldering iron if you fly electric (I like the TS100 best). Drinking Water - I like to fill a water bottle half up with ice cubes and top it full with water. It stays nice and cold as the ice melts for several hours even on a hot summers day. Computerized Battery Charger (for field charging) I generally take my iCharger 306B with me when I do take a charger, but I honesty don't bring the charger often. 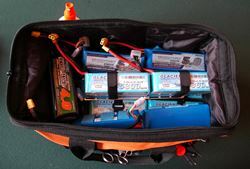 This really depends on how many LiPo packs you have if you can bring enough fully charged ones from home to get you through or need to charge a few here an there. Laptop & Required USB Cables/Dongles for your particular flybarless system/s, ESC/s, data loggers, FPV flight recorders, etc. Battery Powered soldering Iron & solder for electrical wiring/connector repairs out at the field. The TS-100 Digital Iron that can be powered from any 12 to 24VDC power source is by far the most popular for RC field use these days. Well, that just about wraps up what you should, and maybe should, be taking out to the flying field in your RC field box. This is a fairly RC helicopter specific list but much of the same stuff I used with planes as well so if you have a plane, this list should also give you some good ideas.